German Chancellor Angela Merkel already faces complex coalition negotiations with at least three other parties. Now French President Emmanuel Macron wants in on the act. Macron and Merkel on Aug. 28. In a speech at the Sorbonne in Paris on Tuesday, Macron will make proposals for re-shaping Europe that he acknowledges will require Merkel’s support to push through. While he isn’t seeking to interfere in German domestic politics, it makes sense to air the ideas before a coalition is formed rather than after, an official in his office told reporters. Macron needs Germany’s backing for planned overhauls of areas ranging from defense and immigration to the economy. Yet with Merkel weakened in Germany’s vote and her potential Free Democratic coalition partner even more hostile to aspects of euro-area integration than her own party, the prospect of radical change in Europe looks to have diminished. Macron will press ahead with his vision of remaking European institutions anyway, seeking to set the direction of debate. While a key element of his reform package is intended to reinforce the euro against future shocks, his speech won’t be all about the single currency area. Macron will propose as many as 10 projects in his speech, including a European agency for innovation and a system to improve start-up funding, a larger Erasmus student-exchange project, increased anti-terrorism cooperation, and a “digital plan” that includes a joint effort to push the EU Commission for a plan to tax Internet giants such as Apple Inc. and Google Inc. The goal is to have a roadmap in place by the summer of 2018 that will equip the EU for its next decade, according to the French official. Macron intends to discuss his plans with fellow EU leaders at a summit in the Estonian capital Tallinn at the end of this week. He may struggle to engage Merkel after Martin Schulz, her Social Democratic election challenger, upset her own plans by announcing his intention not to renew their respective parties’ coalition of the past four years. The decision by Schulz, a former president of the European Parliament, denies her a pro-European partner and forces her to seek an alliance untested at national level with the Greens and the Free Democrats. Negotiations could drag on beyond Christmas and could stumble over FDP policies to allow countries to leave the euro and introduce automatic sanctions in case of excessive budget deficits. Merkel, asked about potential cooperation with Macron, signaled that further euro-area integration can wait while she sets about forming a government. All political leaders with any aspiration to being players in Europe have to balance domestic political reality with their aims at EU level. Just ask David Cameron, who failed to satisfy either camp when seeking EU concessions to help him avert a Brexit referendum. Merkel, as the bloc’s longest-serving national leader, is more adept than most at achieving her goals. Pressure will grow on her to step up on Europe, not least from Macron, who has been forcing the pace on economic reform and deficit cuts at home in a bid to win support for change at the European level. In his own hard-fought election campaign against populist Marine Le Pen this spring, Macron repeatedly argued that Europe represents the solution to France’s woes rather than the problem. There’s also the question of Merkel forging a legacy-making moment in what is almost certainly her final term, according to Wolfgang Ischinger, a former German ambassador to the U.S. who heads the Munich Security Conference. 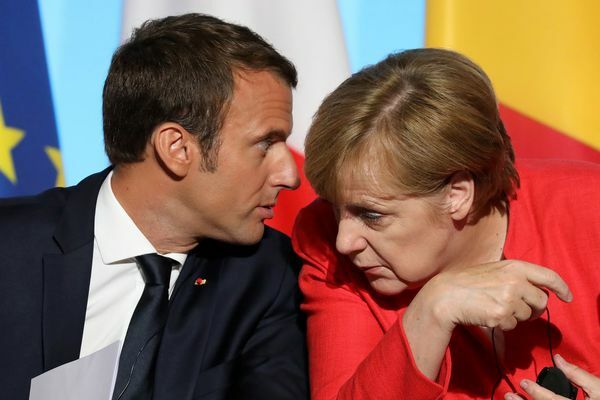 Still, discussions between France and Germany “will be difficult, as always,” said Francois Heisbourg, chairman of the International Institute for Strategic Studies. And in Merkel, “I’m not sure how much of a consensual partner we are going to have,” he said. Marcel Duchamp e la Macchina Celibe.